Brief Description: Flake foods are a popular staple diet for most tropical marine and freshwater fishes, as they should be. Dry foods are the most concentrated sources of the nutrition that fishes need to stay healthy, colorful, grow, and reproduce. However, many flake foods contain fillers that aren't so nutritious. Not ours. Our flakes don't need a list of ingredients. They're seaweed, period. The vitamins they contain are put there by mother nature. The flavors are natural. They're made from chopped natural seaweeds, nothing else. No fillers, just pure natural dried seaweed in tasty little flake-sized bits that your herbivores will devour. SeaVeggies Mixed Seaweed Flakes – The Flakefood That's Real. 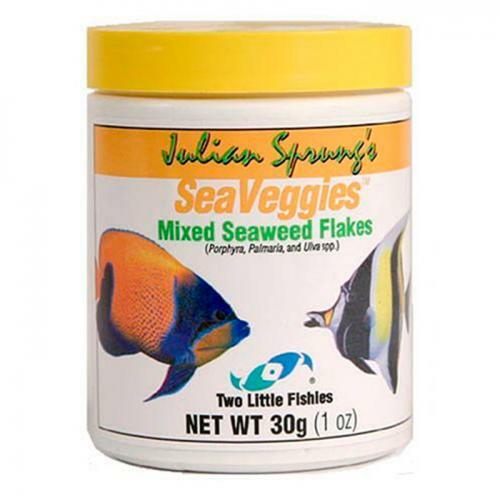 Notify me when "Two Little Fishies SeaVeggies Mixed Seaweed Flakes [30 g]" is re-stocked. For herbivorous Marine or Freshwater Fish. Chopped natural seaweeds, harvested and dried to preserve their high nutritional value. Ideal for Tangs, Angelfish, some large Butterflyfish, Cichlids, Goldfish, Plecos, and Livebearers.